MoBBallet Curator Theresa Ruth Howard caught up with 17 year old Raquel Smith, recipient of a summer intensive scholarship at San Francisco Ballet’s after participating in the historic audition for female Black ballet dancers held at the International Association of Blacks in Dance conference in Denver Colorado Jan. 24th 2016. 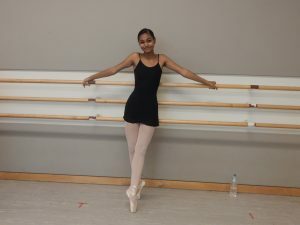 She received 6 offers to participate in advanced summer intensives (San Francisco Ballet, Charlotte Ballet, Houston Ballet, Joffrey Ballet, Pittsburgh Ballet, and Oregon Ballet) with full scholarships. She also received an offer from the Colorado Ballet to join their Studio Company for the 2016-17 season. She accepted and attended summer intensives at Oregon Ballet School, and San Francisco Ballet School and was invited to attend the latter for the year. MoBB invited her to share her experience thus far. ⟵Black Ballerina Movie Screening Schedule! !